Updated October 21, 2018 By // by Kris. This post contains affiliate links. This means we may make a small commission, at no extra cost to you. 2 weeks in Japan is just perfect! 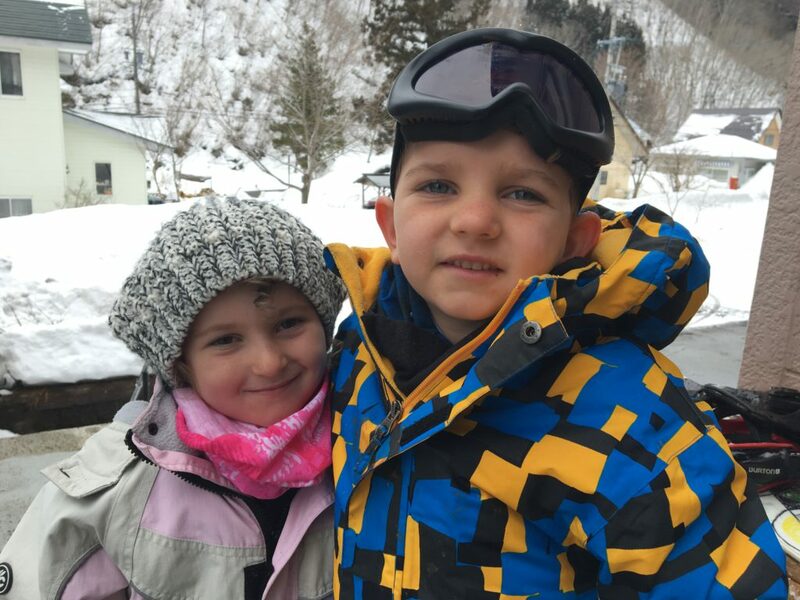 Japan is an incredible place to take your family for a holiday. 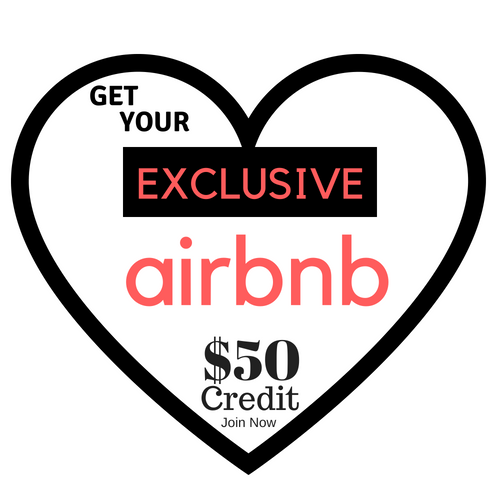 Have you been yet? This post may contain affiliate links. Please read our Affiliate Disclosure for more info. For a detailed look at what to do in Tokyo for 5 nights, read this. Confused about which Tokyo district to stay in? Read this. We recommend Shinjuku! 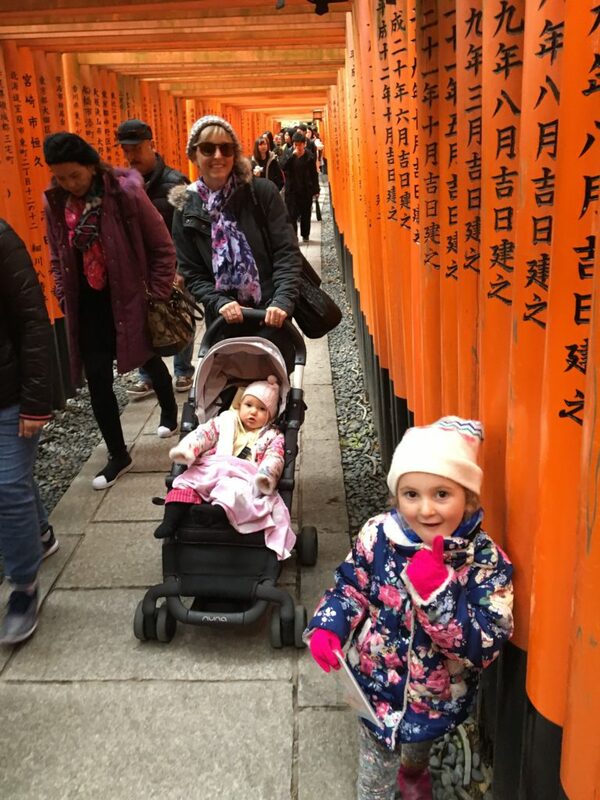 We liked to keep our Japan itinerary down to a maximum of 3 different cities for this visit. If you have a lot of luggage and/or kids, then you should keep it simple. 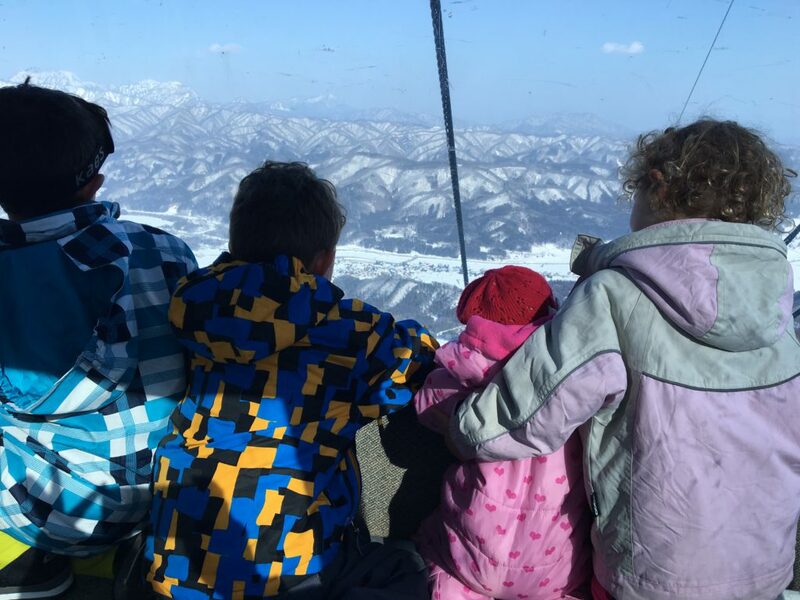 This itinerary works for if you have young children, and especially if you are visiting between December to March as Hakuba is a stunning snow resort close by to Tokyo. For a detailed route planner, you need to download the Hyperdia App before leaving home. Some trains and most train stations around Japan have free wifi, and if you don’t have data roaming on your phone, make sure you take a screen shot of your route for reference as you go along. I love to have it in my pocket and keep checking and rechecking as we change trains etc. So after staying for 5 epic nights in Tokyo, the easiest way to get to Hakuba was via the once daily express train from Shinjuku Station to Hakuba Station. This train leaves Shinjuku 7.30am daily and it is kind of in the middle of peak hour in the World’s busiest train station. So, we caught the first subway of the day from our closest train station that got us the one stop to Shinjuku by 6am so we could buy tickets and find our platform and be all sorted out before any peak hour craziness began! We sat on the platform for over an hour in a light Siberian breeze, but it was worth it to avoid train travel in sardine packed trains with sleeping babies and luggage. When you book a train ticket at the JR office in any station, the officers there can speak English and credit cards are accepted. They give you 2 tickets for the bullet trains, one is the basic fare, and the other is the Super Limited reserved or non-reserved seat ticket. In my experience, I would recommend paying the little bit extra and getting a reserved seat to avoid having to run for a seat, especially when you have kids and luggage. There are kiosks everywhere on the platform and in the stations, and when you are travelling along, people sell food in the aisles too. There are toilets in each carriage. With the reserved seat fee of 3,100, this total fare comes to 8,500 Yen per person. This is the best way to get to Hakuba that we found. 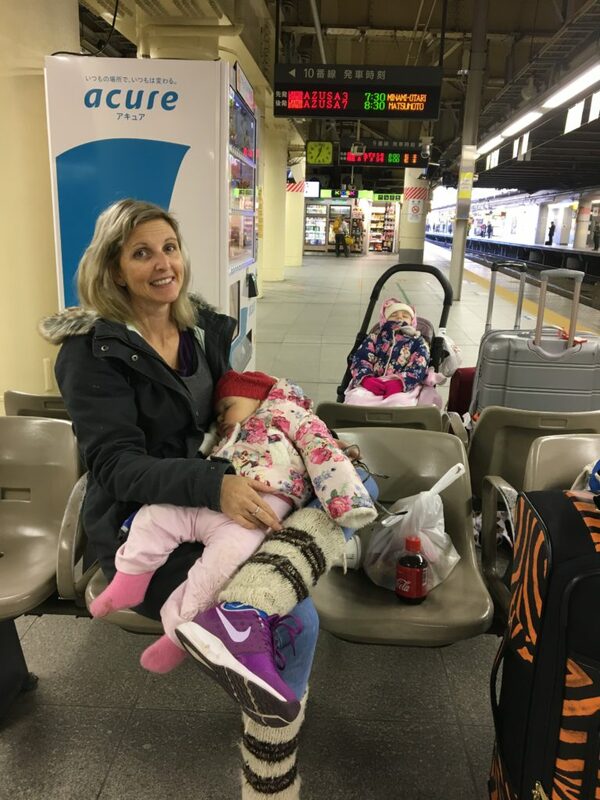 Our Airbnb host collected us from the train station with a van big enough for our group and the bag we had sent from Narita Airport full of our ski gear met us there too. This Black Cat Courier service is the best way to transport extra luggage or ski gear so you can avoid having to handle it on Tokyo trains. It’s cheap too! There is a desk at Narita Airport just follow the Black Cat sign. We had a blast in the snow. We chose Hakuba for it’s proximity to Tokyo and it was pretty well priced for accommodation, gear hire and lift passes. And the snow was epic! 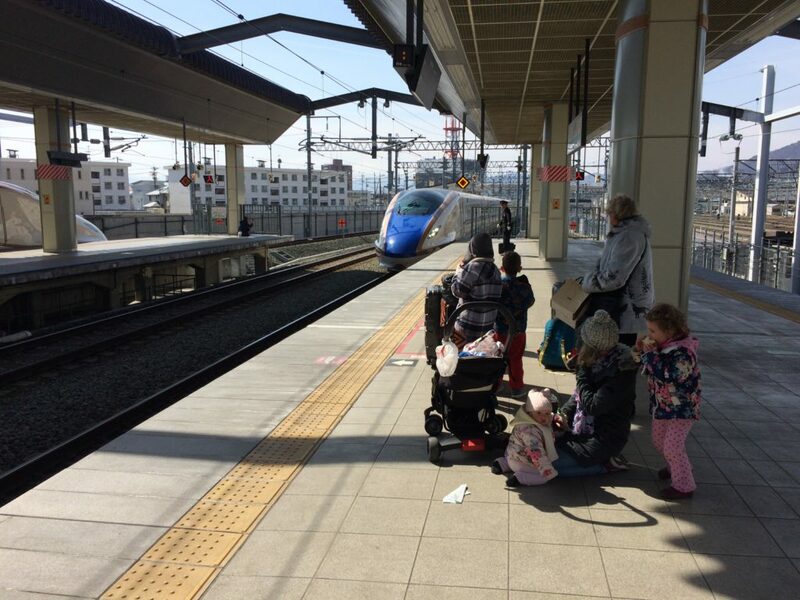 After 5 nights we once again consulted our Hyperdia for the quickest and easiest route to Kyoto and found a 1 hour bus ride to Nagano after which we caught 2 trains to Kyoto. The 209 minute trip from Nagano to Kyoto cost 14,050 Yen each with reserved seating. 3 amazing nights in Kyoto was the perfect thing to top off our Japan adventure. Of course we didn’t want to leave! and the wonderful and interesting Tsujiki Fish Market. as well as done a day trip to the Nara Deer Park. In Kyoto the busses are more frequent and have better routes than the trains and if you have a hotel that is close enough, the best way to get around is actually walking! But not if you have 4 kids and it’s raining. 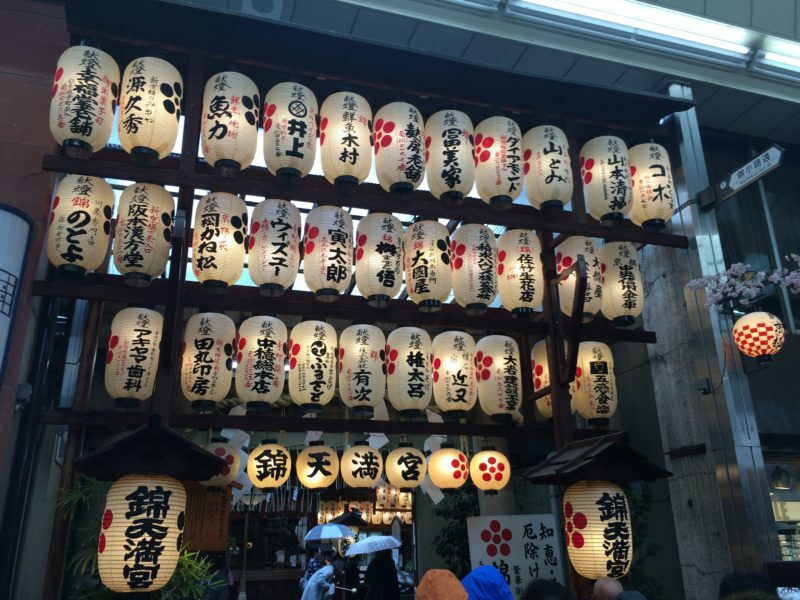 Our last day in Japan was spent travelling back to Narita where we could catch our flight back home in the evening. It only takes 212 minutes to get all the way from Kyoto to Narita International Airport changing to the Narita Express at Shinagawa and the route takes you right past Mt Fuji where you can hope to glimpse the peak on the way past on a clear day and thus tick the box! For us, 2 weeks was a great length of trip. 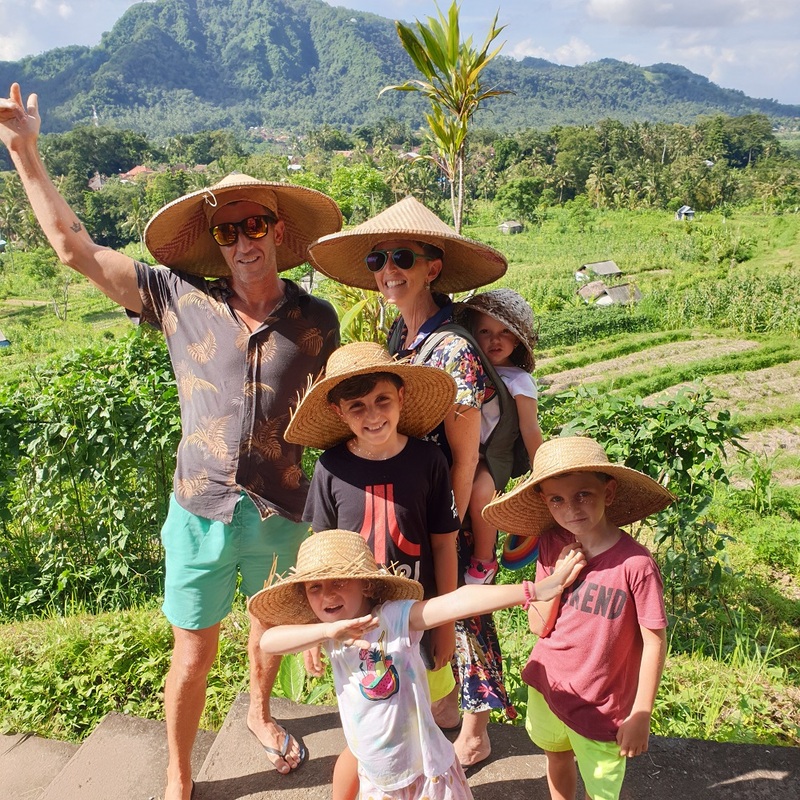 With the kids at the ages of 10 months, 4, 6 and 8 we really couldn’t push them much farther than we did and I really loved my plan of only staying in 3 different places. 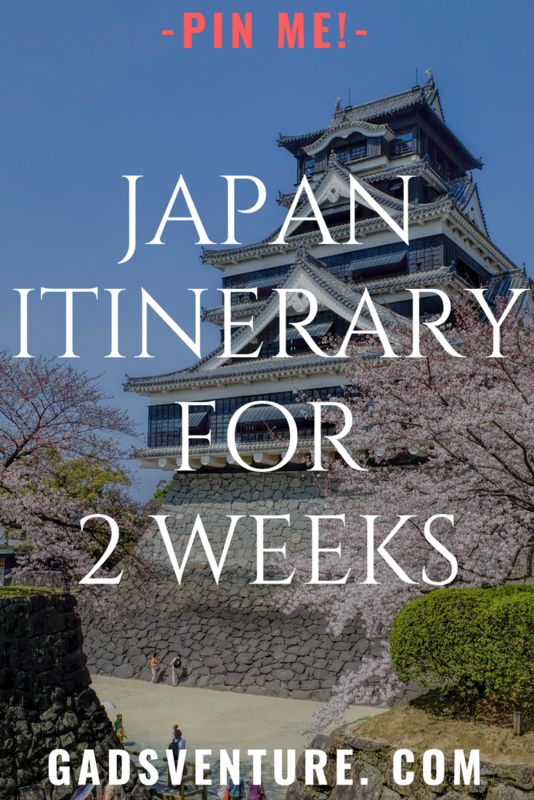 There are so many different options for visiting Japan and this 2 weeks in Japan Itinerary is really flexible adaptable for you. This is definitely a Winter plan too. When planning a trip to Japan, it is important to make a list of all the places you must see and have an itinerary planned with backups for inclement weather. I book all my accomodation through Airbnb and use Lonely Planets to find out where to go. 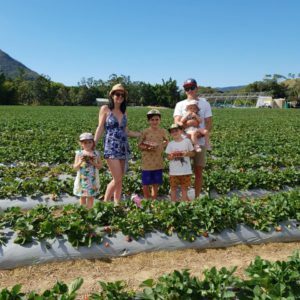 Receive the latest news and discounts for family travel!